Well that was grim. I said last week that i get more pleasure these days from just standing and looking at the new stadium in parra, i did that yesterday and it is all that is getting me through. 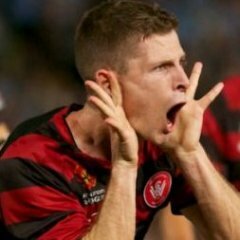 What was the late change that Thwaite mentioned in the post match ? I would guess Bridge hurt himself during warmup? So we elevated either Carrusca or Lustica to the starting lineup. Bridge was the only outfielder who didn't come on, and you'd think he would have come on to play left wing instead of Santalab if fit. You’re only writing this season off now? Season was doomed as soon as Popa walked out. i'm staying away from predictions from now on, honestly do not have a clue what this team is playing at, which ever team we have, too much bloody chopping and changing. Pick your best eleven, go with a system and bloody stick to it, it's like a f****g revolving door on the changing room at the moment, some stability please. No wonder football is struggling to attract fans in this country. Footballer goes down under contact in the box. I agree that the Var is ****, does it qualify as an “obvious error”? We were doomed the moment we left parra for sop. Shame to be a Wonderer with this **** team. So did Fox ever bother to show the replay for the offside leading up to the first goal? b) the VAR didn't bother to check that kinda important part and they didn't wanna show it to be clearly offside...which judging from the one replay they did show, he must have been. How could he possibly end up so far in front of our defence seconds later? Either way, it shows what a sham the VAR is. We're reduced to ten men (and have a player missing next week) because they either couldn't or didn't check the first phase of the play, but did check the final one??? It's an absolute farce. Again, like the Adelaide game, I'm not gonna bother condeming our team, because that is just a massively unfair advantage to have to play against for most of the game. That's without even getting into Reddy only getting a yellow. The scoreboard says Perth won. But with 10 men for 84 minutes and us being crap anyway with 11 men and not normally being able to score a second half goal. With Perth unable to score in the second half and playing at home. I think we were possibly the better side. Doesn't say much for Perth.